Welcome to Purposed Physical Therapy’s guide to patellar tendonitis. The large quadriceps muscle ends in a tendon that inserts into the tibial tubercle, a bony bump at the top of the tibia just below the patella. This is called the infrapatellar tendon or patellar tendon. 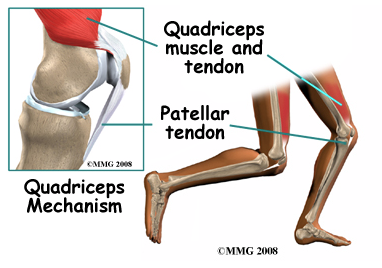 Another tendon, the quadriceps tendon, attaches from the quadriceps muscle into the top of the patella. These two tendons, together with the patella, are called the quadriceps mechanism. The long bones of the femur and the tibia act as level arms, placing force or load on the knee joint and surrounding soft tissues. The amount of load can be quite significant. For example, the joint reaction forces of the lower extremity (including the knee) are two to three times the body weight during walking and up to five times the body weight when running. Patellar tendonitis occurs most often as a result of stresses placed on the supporting structures of the knee. Repetitive knee flexion and extension that occurs in such activities as running, jumping, and rising from a deep squat contribute to this condition. Overuse from repetitive sports activities is the most common cause of patellar tendonitis but anyone can be affected, even those who do not participate in sports or recreational activities. Intrinsic factors such as age, flexibility, and joint laxity are also important. Misalignment of the foot, ankle, and leg can play a key role in tendonitis. Factors such as a flat foot position, tracking abnormalities of the patella, rotation of the tibia (tibial torsion,) and a leg length difference can create increased and often uneven load on the quadriceps mechanism that can contribute to the development of patellar tendonitis. An increased Q-angle or femoral anteversion are two common types of misalignment that contribute to patellar tendonitis. 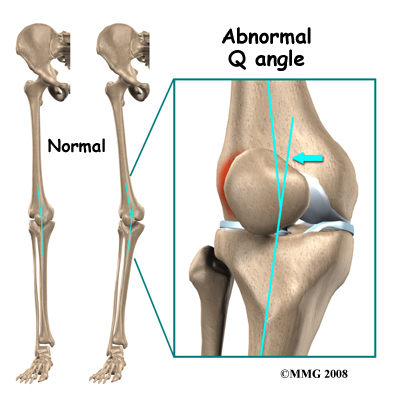 The Q-angle is the angle formed by the patellar tendon and the axis of pull of the quadriceps muscle. This angle varies between the sexes. It is larger in women compared to men. The normal angle is usually less than 15 degrees. Angles more than 15 degrees create more of a pull on the tendon, and can create painful inflammation. Femoral anteversion is an anatomical inward twisting of the femur (thigh bone.) This twisting affects where the patella sits on the top of the knee joint as well as how the force of the quadriceps muscle pulls along the quadriceps mechanism. Any muscle imbalance of the lower extremity (from the hip down to the feet) can impact the quadriceps muscle and affect the joint. Individuals who are overweight may have added issues with load and muscle imbalance leading to patellar tendonitis. 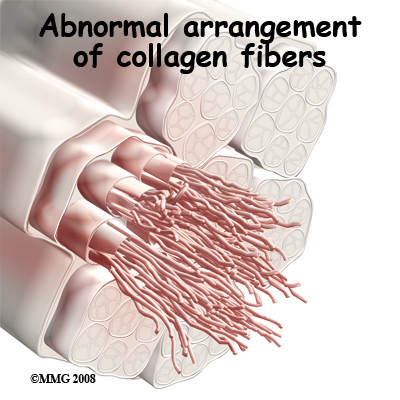 Strength of the patellar tendon is in direct proportion to the number, size, and orientation of the collagen fibers that make up the tendon. Overuse is simply a mismatch between load or stress on the tendon and the ability of that tendon to distribute the force. If the forces placed on the tendon are greater than the strength of the structure, then injury can occur. Pain develops when microtrauma to the musculotendinous junction develops due to the repetitive pull during knee flexion and extension. Tissue breakdown then occurs triggering an inflammatory response that leads to tendonitis. Chronic overuse leads to a problem called tendonosis. Unlike with tendonitis, inflammation is not present in tendonosis. Instead, degeneration and/or scarring of the tendon due to long term wear and tear develop and are the cause of the problem. Chronic tendon injuries are much more common in older athletes (30 to 50 years old). What does patellar tendonitis feel like? 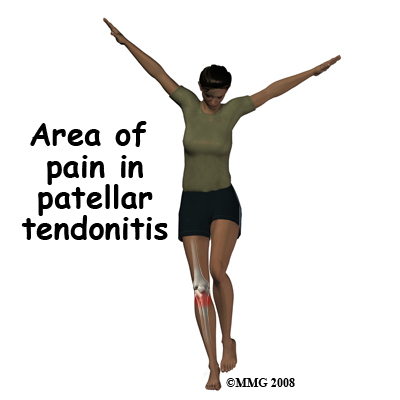 Pain from patellar tendonitis is felt just below the patella, often right at the tendon attachment to the kneecap. The pain is most noticeable when you move your knee or try to kneel. The more you move your knee, the more tenderness that develops. There may be swelling in and around the patellar tendon and the tendon may be very sensitive to touch. You may feel a sense of warmth or burning pain. The pain can be mild or in some cases the pain can be severe enough to keep the runner from running or other athletes from participating in their sport. The pain is worse when rising from a deep squat position. Resisted quadriceps contraction with the knee straight also aggravates the condition. Diagnosis begins with a complete history and physical examination. Your Physical Therapist at Purposed Physical Therapy will ask questions about where precisely the pain is, when the pain began, what you were doing when the pain started, and what movements aggravate or ease the pain. As mentioned above, extrinsic factors such as training history as well as type of footwear are important for us to inquire about. The history alone will often lead your Physical Therapist to the suspicion of patellar tendonitis. Next your Physical Therapist will do a physical examination of the knee and entire lower extremities. They will palpate, or touch, around the knee and particularly along the patellar tendon to determine the exact location of pain. Your Physical Therapist will look for the individual intrinsic factors mentioned above, such as alignment, flexibility and joint laxity that may be affecting your knee. They may want to look at how you stand, your foot position, or watch you walk, squat, or jump. Your Physical Therapist in Greenvillewill also check the strength and lengths of the muscles surrounding and affecting the knee joint such as the quadriceps, hamstrings, calves, hip flexors and buttocks muscles. All of these muscles, if weak or tight, can contribute to the forces applied to the knee joint and contribute to the development of patellar tendonitis. Providing resistance while you straighten your knee generally reproduces the pain associated with patellar tendonitis so this will also be tested. Lastly, your Physical Therapist will assess the stability of the knee joint to determine if the laxity of the ligaments and tissues surrounding the knee joint are contributing to the problem. Often patellar tendonitis can be positively diagnosed from the history and physical examination and does not require further investigations. At times, however, further diagnostic tests may be required to either confirm or rule out the diagnosis, or to determine if there are any micro tears in the tendon that may be limiting the tendon from healing as expected. Tests such as ultrasonography or magnetic resonance imaging (MRI) may be used in these cases. Ultrasound uses sound waves to detect tendon tears. MRIs use magnetic waves (rather than X-rays) to create pictures that look like slices of the knee. Normal MRIs do not require any needles or special dyes and are painless. These pictures show the soft tissues of the body. Usually, this test is done to look for other injuries such as tears in the quadriceps. It is also used, however, to identify tears in the patellar tendon and can also confirm inflammation in the area. If your Physical Therapist determines that it would be useful in your case to obtain an ultrasound or MRI, they will inform you of the quickest and most appropriate method of obtaining the investigation. 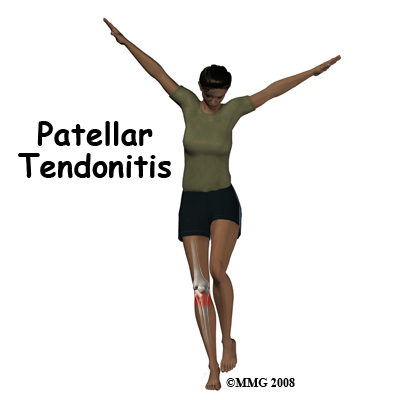 Patellar tendonitis is usually self-limiting. That means the condition will resolve with rest, activity modification, and Physical Therapy. Recurrence of the problem is common for patients who fail to let the patellar tendon recover fully before resuming training or other aggravating activities. Your initial treatment for acute patellar tendonitis at Purposed Physical Therapy will aim to decrease the inflammation and pain in the knee. Simply icing your knee can often assist with the inflammation and relieve a great deal of the pain from patellar tendonitis. In cases of chronic tendonitis, heat may be more useful in decreasing pain. Your Physical Therapist may also use electrical modalities such as ultrasound or interferential current to help decrease the pain and inflammation. Massage especially for the quadriceps muscle may also be helpful. Medication to ease the pain or inflammation can often be very beneficial in the overall treatment of patellar tendonitis. Your Physical Therapist may suggest you see your doctor to discuss the use of anti-inflammatories or pain-relieving medications in conjunction with your Physical Therapy treatment. Your Physical Therapist may even liaise directly with your doctor to obtain their advice on the use of medication in your individual case. As inflammation of the patellar tendon most often occurs due to repetitive activity, rest is an important part of the treatment of patellar tendonitis. ‘Relative rest’ is a term used to describe a process of rest-to-recovery based on the severity of symptoms. If you are experiencing pain while doing nothing (resting) it means the injury is more severe and your Physical Therapist will advise a period of strict rest and possibly even a short time of immobilization in a splint or brace to prevent any repetitive knee flexion/extension. When pain is no longer present at rest, then a gradual increase in activity is permitted so long as there is no return in resting pain. Once the initial pain and inflammation has calmed down, your Physical Therapist in Greenville will focus on improving the flexibility, strength, and alignment around the knee joint and entire lower extremity. Static stretches for the muscles and tissues around the knee (particularly the quadriceps and iliotibial band on the outside of the knee) will be prescribed by your Physical Therapist early on in your treatment to improve flexibility. Again, any tightness in the muscles or tissues around the knee can increase the pull on the patellar tendon or affect alignment during walking, running or jumping so it is important to address this immediately. Dynamic stretching (rapid motions that stretch the tissues quickly) will also be taught and will be incorporated into your rehabilitation exercise routine as part of your warm-up once you return to doing more aggressive physical activity. Dynamic stretches are used to prepare the tissues for activity whereas static stretches focus more on gaining flexibility. Strength imbalances will also affect the alignment of the knee and can cause muscles to tighten. Your Physical Therapist will determine which muscles in your individual case require the most strengthening. Strength in both the knee and the hip (which controls the knee position) are very important. When bending the knee, the patellar tendon is placed under load while it is stretching. This load can be tremendous especially when jumping or landing. In order to prepare the healing tendon to take this load, your Physical Therapist will prescribe ‘eccentric’ muscle strengthening. Eccentric contractions occur as the muscle lengthens and the tendon is put under stretch. Bending your knee quickly into a squatting position and then stopping rapidly (drop squats) encourages the knee to adapt to the force that will eventually be needed to return to physical activity. When appropriate, weights can be added to simulate the increased body weight that the knee endures during running and jumping. Your Physical Therapist may even ask you to do this exercise on board slanting downwards (approximately 25 degrees) which has been shown to also increase the force through the tendon. In addition, an electrical muscle stimulator may be used which encourages improved recruitment of the muscles it is stimulating. All exercises should be completed with minimal or no pain and advancing the exercises should be done at the discretion of your Physical Therapist as not to flare up the healing tendon. In addition to stretching and strengthening the knee, bracing or taping the patella can help you do exercises and activities with less pain. Your Physical Therapist can educate you on which brace would be most appropriate for you. Most braces for patellofemoral problems are made of soft fabric, such as cloth or neoprene. These braces work by encouraging proper alignment of the patella in the femoral groove and/or by distribute the force on the patellar tendon. This in turn is thought to improve the functioning of the quadriceps mechanism. An alternative to bracing is to tape the patella in place. Your Physical Therapist can do this for you and also teach you how to do it for yourself. Taping is an easy and cost-effective way to determine if a brace will decrease your pain before actually investing in one. Patients commonly report less pain and improved function with both taping and bracing. Proper alignment of your entire lower extremity is paramount to decreasing the overall stress that is placed on your patellar tendon. In addition to strengthening and stretching, foot orthotics may be useful to correct your foot position, which in turn then encourages proper alignment up the lower extremity chain. Your Physical Therapist can advise you on whether orthotics would be useful for you, and also on where to purchase them. A critical part of our treatment for patellar tendonitis at Purposed Physical Therapy includes education on returning to physical activity. Bending and straightening your knee occurs often even in everyday activities such as walking or stair climbing so a patellar tendon that is recovering from injury can easily be aggravated. Returning to your normal physical activity at a graduated pace is crucial to avoid repetitive tendonitis pain or a chronic injury. Your Physical Therapist will advise you on the acceptable level of activity at each stage of your rehabilitation process and assist you in returning to your activities as quickly but as safely as possible. With a well-planned rehabilitation program and adherence to suggested levels of rest and activity modification, most patients are able to return to their previous level of activity without recurring symptoms. ﻿Purposed Physical Therapy provides services for Physical Therapy in Greenville. Some cases of patellar tendonitis, unfortunately, even with appropriate treatment can be recalcitrant. In these cases, your Physical Therapist at Purposed Physical Therapy may ask you to return to see your doctor to discuss more aggressive forms of treatment. Cortisone injections may be used directly into the tendon if oral anti-inflammatories and conservative Physical Therapy has not eased the pain. Doctors are cautious, however, with the use of cortisone near tendons as repetitive injections can weaken the tendon and cause further problems. Extracorporeal shock wave therapy is a form of therapy that uses high intensity sound waves directed at the tendon to promote healing and may be effective in relieving the pain associated with patellar tendonitis. Autologous blood injections are a relatively new form of treatment where a portion of the patient’s own blood (plasma) is injected directly into the patellar tendon. This is thought to stimulate healing in the injured tendon. Ongoing research regarding its effectiveness is needed. Surgery is rarely needed to treat patellar tendonitis. If nonsurgical treatment fails to improve your pain and allow return to your activity, however, then surgery may be suggested. Surgery is designed to stimulate healing through revascularization (restoring blood supply). Weak, damaged tissue is removed and the injured tendon is repaired. Some extreme cases may require surgery, which relocates the attachment of the patella in order to change the force that goes through it. Arthroscopic revascularization procedures can usually be done on an outpatient basis (you can leave the hospital the same day.) If your problem requires a more involved surgical procedure (moving the patellar tendon attachment) you may need to spend one or two nights in the hospital. Surgeons will generally have their patients take part in formal Physical Therapy after patellar tendon surgery. More involved surgeries for patellar realignment or restorative procedures for tendon tissue require a delay before going to therapy and rehabilitation may be slower to allow the tendon to heal before too much strain is put on the knee. Once clearance is given by your surgeon, our treatment at Purposed Physical Therapy will be similar to the rehabilitation outlined above. If, however, during post-surgical rehabilitation your pain continues longer than it should or Physical Therapy is not progressing as your Physical Therapist would expect, we will ask you to follow-up with your surgeon to confirm that the tendon is tolerating the rehabilitation well and ensure that there are no complications that may be impeding your recovery.